AMID threats of violence from izinduna, Mpukunyoni community members on Monday marched to the Mpukunyoni Traditional Council offices in protest against what they deem corrupt leadership. ‘Mpukunyoni Traditional Council must fall!’ was sung by the 300-strong crowd of protestors as Bongani Pearce, march organiser and Chairman of the Mpukunyoni Community Property Association read, out the terms of their grievances outside the locked gates of the traditional council offices. 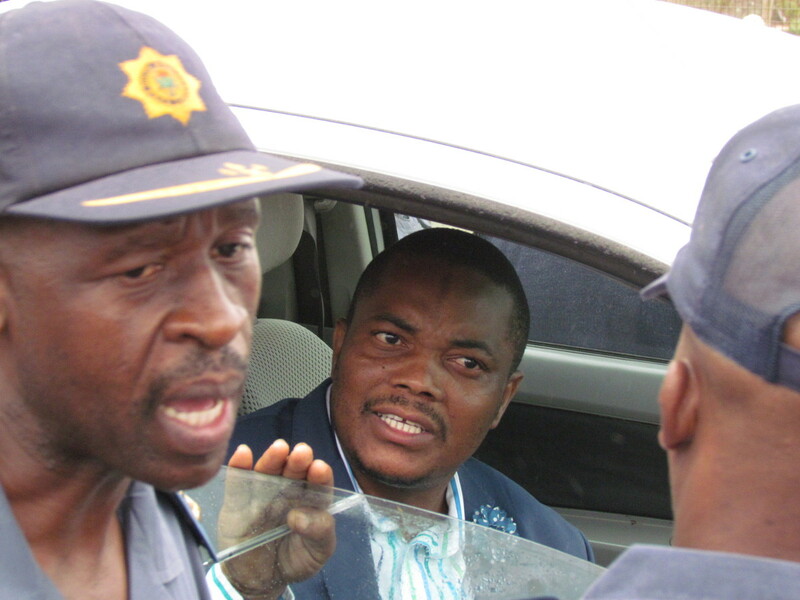 Forced to remain inside his locked vehicle, Pearce was threatened with violence by izinduna who prevented him from handing over the memorandum at the council office. ‘Blood will be spilled,’ warned Goodwill Sboniso Mkhwanazi of the Nomathiya Royal Household and a member of the Mpukunyoni Traditional Council. Mkhwanazi claimed, ‘The march was not authorised and police should not be protecting these people who marched to our offices illegally’. He further stated he would inform the KZN Police Commissioner of the KwaMsane Station Commander’s ‘incompetence’ in protecting so-called illegal marchers and accused the Station Commander of conspiring to carry out an illegal march. ‘Permission was gained from Mtubatuba Municipality but there was confusion as the incorrect date was written on the form,’ said the Station Commander. ‘It is our duty to protect the protestors’. Had the marchers not been under police protection, it is feared the violence threatened by izinduna may have been carried out. In an interview, Mkhwanazi listed the reasons Pearce should not be trusted, accusing him of selling shares in a start-up company and disappearing with the shareholders’ money. He also accused Pearce of attempting to overthrow Nkosi Mkhwanazi, citing this as the reason for the march. 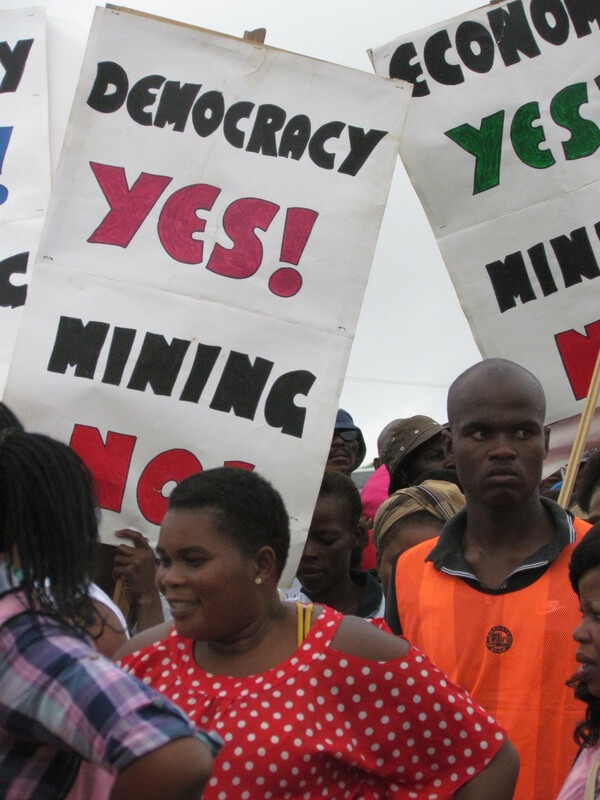 Community members marched from Somkhele Clinic to the offices of the traditional council to protest against what they term the illegal benefiting of certain traditional leaders from Somkhele mine. A memorandum detailing the community’s grievances was handed to a COGTA (Co-operative Governance and Traditional Affairs) representative who later returned after all political figures, including Mtubatuba Municipal Mayor and Deputy Mayor Israel Nyawo and Aidhika Roy, had left prematurely. Among the grievances was the community’s call for the Mpukunyoni Traditional Council to be disbanded. Regarding certain indunas personally benefiting from Somkhele mine, Tendele Coal Mining said in a statement, ‘The Tribal Authority receives a monthly management fee which is allocated to administration costs and payments to indunas who participate in the formal communication and consultation structures of communities directly affected by the Somkhele mine’.